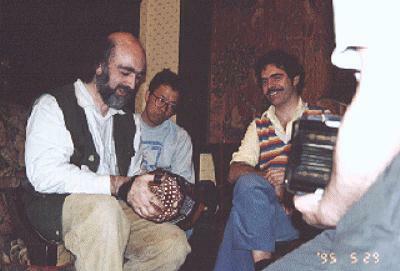 Colin Dipper, the well-known maker of concertinas, is seen in this picture playing his new "franglo" system concertina. The system is derived from the melodeon or button accordion. On the right hand the three rows correspond directly to the right hand end of a three row button accordion. The left hand (not visible) has bass buttons again corresponding to those of a button accordion bass. The system gets its name from French Anglo, as it was a French melodeon player who first suggested the system to Colin. The picture was taken by Maki Takiya of Japan at Chippenham Folk Festival in 1995.